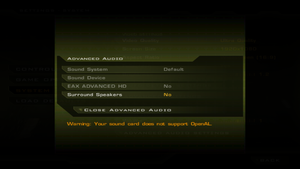 The game does not properly recognize the available VRAM on modern graphics cards, and as such forces the game to use lower image quality settings. Use Quake 4 Tweaker to resolve. SafeDisc v4.60 DRM. Install latest patch to remove disc check. A free client provided by id allows Quake 4 to be played natively on Linux machines. It requires either a full retail copy or the demo to use it. Details can be found on the GamingOnLinux article. A faithful higher quality icon can be found from IconArchive. Patch 1.4.2 is the latest version. GOG.com and Steam versions are already patched. 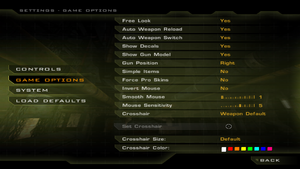 Use Quake 4 Tweaker for custom/unlisted resolutions. 90°. Use Quake 4 Tweaker. Sikkmod's HDR feature only adds HDR Rendering. Add seta image_anisotropy 16 for the highest quality. Disabled by default. Use m_accel 1 in the console to enable. Only a single volume slider. First enable surround speakers setup in the Windows control panel. Only available in the European local retail release. 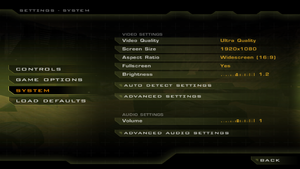 The game does not properly recognize the available VRAM on modern graphics cards, and as such forces the game to use lower image quality settings. Right-click → New → String Value. 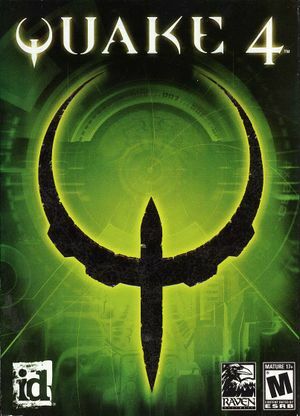 Put the full path to Quake4.exe in the name, e.g. C:\Program Files (x86)\Steam\steamapps\common\Quake 4\Quake4.exe. Open your newly created string and type in RUNASINVOKER and confirm it. Search the line seta com_allowConsole and set the value to "1". This solution may cause speech lipsync to go out of sync, but gameplay should be unaffected. r_swapinterval controls VSync. 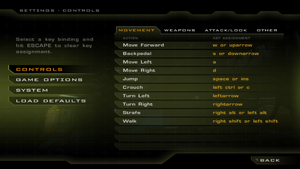 Sikkmod is a mod that was ported from Doom 3, which adds such effects as bloom, color grading, HDR and FXAA, and is easily configurable via the in-game menu. 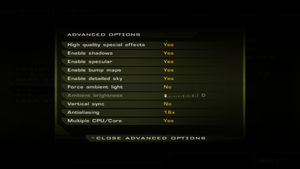 The game's multi-core rendering may cause problems with this mod, disable that setting if there are graphical glitches. False Dawn is a non-linear, multiple-goal mission with up-to-date graphics (powered by Sikkmod). Windows 98 has been tested to work with Quake 4, but this is not officially supported. ↑ 2.0 2.1 File/folder structure within this directory reflects the path(s) listed for Windows and/or Steam game data (use Wine regedit to access Windows registry paths). Games with Steam Cloud support may store data in ~/.steam/steam/userdata/<user-id>/2210/ in addition to or instead of this directory. The app ID (2210) may differ in some cases. Treat backslashes as forward slashes. See the glossary page for details. ↑ https://ubuntuforums.org/showthread.php?t=1311090 Quake 4 alt+tab, how?